The study investigates the socio-economic changes in Catalan villages located between 40 and 115 kilometres from Barcelona. The counter-urbanisation phenomenon driven by high property prices in Barcelona has led to the movement of people back into villages in the surrounding region. Can Cloke's index of rurality be applied to these villages? Barcelona's more remote rural areas: villages in decline? 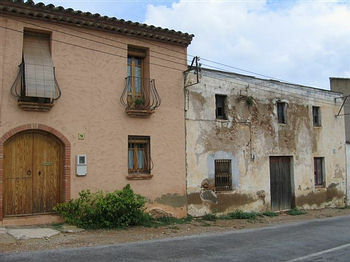 A village that is becoming more urban in its character located near to Barcelona. Often this type of village will have a rural atmosphere, which is the sort of environment the commuters are looking for. The unadulterated villages tend to be found at an intermediate distance between urban areas. They are too far to commute from with ease but not so far as to become isolated. This sort of village maintains much of its original characteristics. If a more isolated village is found to be in a Natural Park or area of outstanding natural beauty it can become a village of second homes. Affluent city dwellers will often buy second homes in such locations to use on the weekends or during holidays; this has the effect of raising the local house prices, forcing the younger generations especially out of the area. If a village is isolated and inaccessible it is likely to go into a downward spiral. As the younger generations leave to find work, there is a reduced need for services, with fewer services people leave and so on. The methodology utilised ensures that students are able to study up to ten villages during the day, which may include the use of transects and questionnaires. Our staff assist students with translation as necessary.